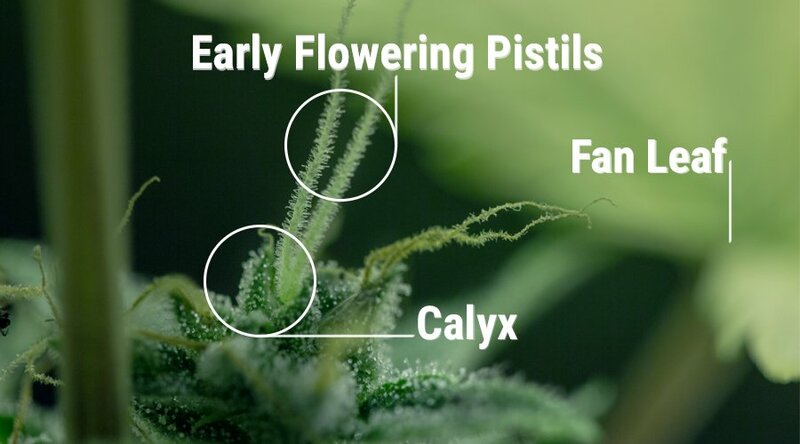 Knowing what a calyx is and what parts the calyx is comprised of can provide the cannabis grower with tips and tools to help with a successful and easy harvest. The calyx is the first part of the flower that is formed when a young plant enters its flowering stage, if it is indeed a plant that is capable of flowering of course. In a perfect spiraling Fibonacci sequence the plant quickly and in the most efficient way forms a protective platform comprising of small leaves, which are called the sepals. This protective platform for the flower in its entirity is called the calyx. The calyx is designed to protect the plants reproductive organs in between the sepals and provide the flower with a base of stability. Even though all flowering male and female plants have calyxes, it is when looking at cannabis plants specifically, that only the calyxes of the female plants are of interest to the aspiring cannabis grower. When cultivating cannabis, the objective is to harvest nice big colas of which the calyxes are a part. Not just any ordinary part, but the most important part, because the calyxes are where you find the reproductive organs of the plant, called the pistils, and the trichomes. The pistils are where you see the long hairs coming from; these hairs are called stigmas. The stigmas will start out white when the plant is still in its early flowering stage, but will turn amber or yellow, and ultimately brown, as the plant progresses through its flowering stage. The trichomes are the resin glands where the cannabinoids are formed, including the psychoactive and more familiar THC. 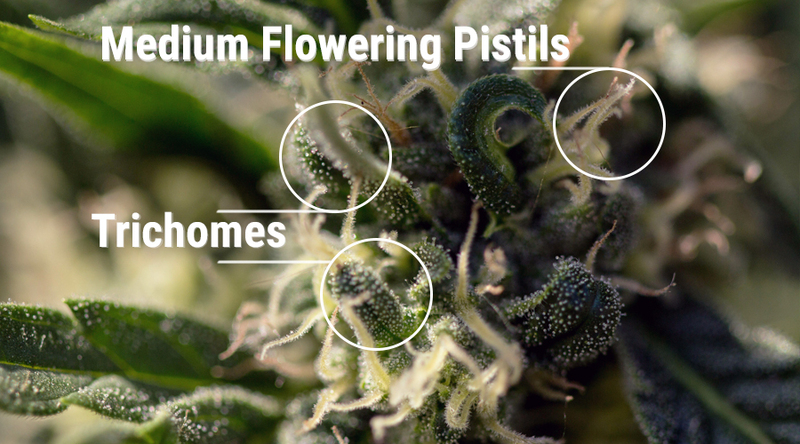 The pistils are also the best tool a grower to spot the difference between the male and the female plants. It is important to recognize the male plants early on so they can be removed and any risk of pollination can be minimized or even excluded. Female plants can be recognized by their long white hairs, that will begin to form early in the flowering stages of forming the buds or colas. The male plants will have pollen sacks, that will start to dangle in a downward fashion and eventually will burst open to pollinate the female calyxes. The stigmas or long hairs can help a grower identify when a plant is ready to be harvested. In the first weeks a female cannabis flower or bud is formed, it will have long white hairs coming out if it. After 4 to 5 weeks the stigmas will start to turn yellowish. When about 50 to 80 percent of your plants' buds have stigmas, that have turned yellow or amber, they are ready to be harvested. If you harvest later, the stigmas will turn brown and dry out; do not wait this long to harvest your cannabis plants, as it will have your buds lose potency and taste. In fact most of the cannabinoids are formed in the pistils and the calyxes of the cannabis plant. This is the flower part of the plant, that will eventually be harvested, dried and cured and ultimately will be ready for consumption. The consumption part is why you do not want your female plants to be pollinated; they would start to form seeds, which are a real hassle to remove and leave a horrible taste and crackling sound when smoked. Also most of the female plants energy will be diverted into making the seeds, not swelling up the buds and forming cannabinoids. If you intentionally aim to make your own strain of cannabis by crossing two breeds or strains, watch the calyxes of your developing plants to identify the males and females you want to use for your experiment. When harvesting your cannabis plants, you will have to trim off the leaves to expose the buds, which then in turn can be properly dried and cured. The big leaves, that grow lower on the plant and in between the budding areas, but not in the buds or cola’s themselves, are called fan leaves; these are basically the solar panels of the plant. These leaves provide the plant with the energy it needs to grow and form buds. The few fan leaves that remain after pruning during the flowering stage can be easily trimmed away at harvest when growing indoors. When growing outdoors, most fan leaves will still be attached to the plant at the end of the flowering stage but these can be easily removed at the time of harvesting. There are also leaves sticking out of the buds themselves; these are called sugar leaves, because they are coated with trichomes, that look sugary white, and these are a lot harder to trim, because the high level of resin makes them very sticky. Sticky leaves mean you will have to clean your equipment more and the tools you are using will get harder to operate due to the moving parts getting stuck together. The sugar leaves is what the calyx-to-leaf ratio is all about, it tells you how much of a hassle it is going to be to trim when harvested. 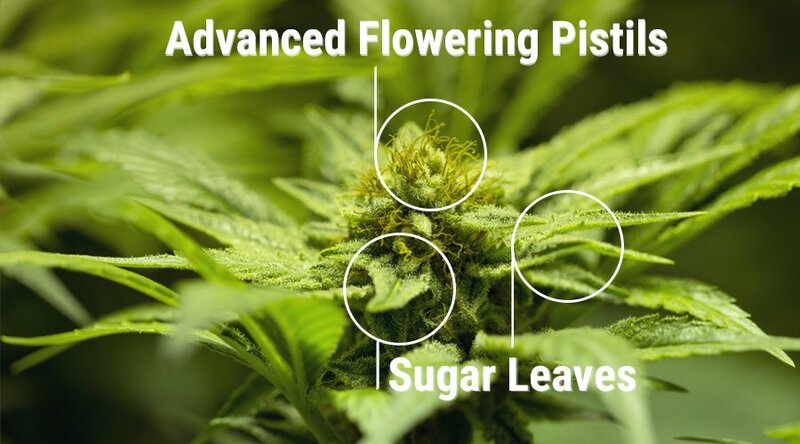 Plants with a high calyx-to-leaf ratio have fewer sugar leaves, making the buds or colas easier to trim. Sugar leaves aren’t all bad though; they can be very well used to make edibles or cannabutter, tinctures, extractions, topicals or even hashish. They can even be smoked, but because of the higher combustion temperature of the leaves the taste may be affected.